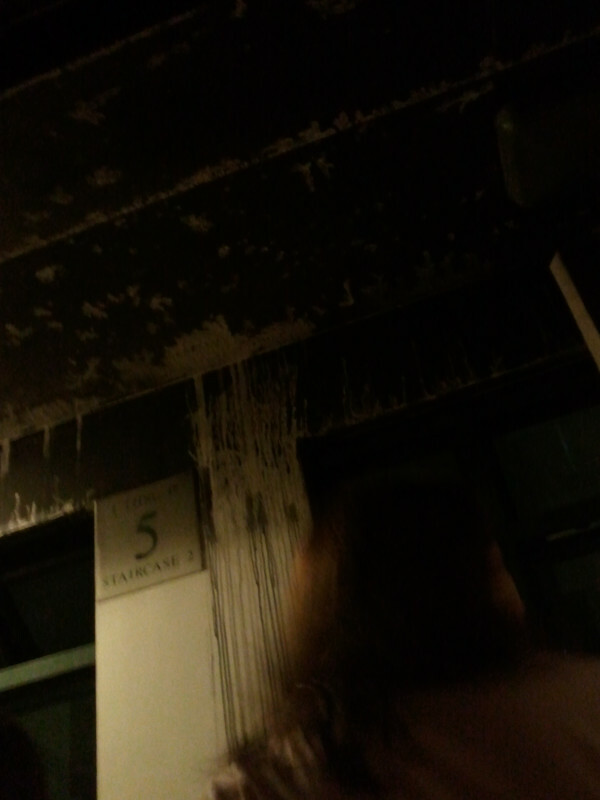 24 Jun 2011: A fire broke out at one of the units in my apartment after midnight. 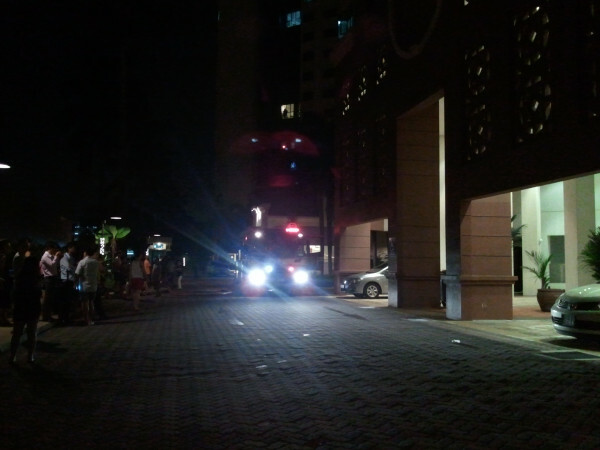 At about 1am, the fire alarm went off, which was quite normal at our condo. That was why most of the residents like me would ignore and stayed at home. At that time, I was watching DVD and wifey just returned from a company event. What triggered further attention was when I started to smell smoke. Wifey also ran out of her room and appeared to notice the situation was unusual (she later told me she heard people shouting “Fire!” which triggered her attention). I calmly walked towards the main door, trying to pin-point where the smell came from. When I opened the door, I found my answer: smoke was seen slowly building up along the common corridor. As I was never been put in a real fire emergency situation, I somewhat felt lost for a minute. My mind wandered and wondered: Was this considered an emergency? Should I stay in our house? Should I just dash out? Do I have time to pack something with me as we flee? Should I switch off all electricity? Do I have time to plan? Is the fire very near my unit, which warrants me to leave instantly? Or is the fire at somewhere distant, which gives me more time to settle the logistics? Eventually, wifey’s reactions said it all. LET’S RUN FOR OUR LIVES! (Ok a bit dramatised). We woke up our helper and Mayenne, who was sound asleep throughout the alarm. She wailed a little, but eventually she was cooperative and did not cry as we made our escape. I grabbed my wallet, my mobile phone and my house keys, put my computer into sleep mode, switched off some lights and left a few on, wetted some towels to allow us to breathe through the smoke. By the time we got to the stairs, we saw many residents already making their way down. After descending for about 3 levels, we found that the smoke was getting thicker. We panicked: does that mean we are stuck at the upper floors and unable to descend? Should we head towards the roof? My first thought was that we should just push on, because the longer we wait, the thicker the smoke would become. To add to the fear, we had no idea where the fire and smoke came from. Were we actually walking into danger? Should we stay put and wait for professional help (i.e. firemen)? Good thing every block has 2 flights of stairs, so we thought of trying the other flight of stairs which could have lesser smoke. We were right. We managed to get past the floor that the smoke originated (5th floor), and the rest of the descent was smoke-free. By the time we got down, the Civil Defence Fire Engine was already there, which meant that the fire was ongoing for quite a while. The security guards were shouting across the void deck, apparently due to some miscommunication, but it was soon brought under control. All the residents waited at the open space. No ambulance came, which meant there was no casualty. I took a peek at the burning unit, which was facing the guard house. There was thick black smoke bellowing out from the window, but no visible fire. For a good 30 minutes, residents were still trickling down from the apartment. They probably lived at the upper levels so was not aware of the situation till much later. We waited for more than half an hour, and seemed that it’s not going to end soon, so I decided to bring Mayenne to my mother-in-law who stayed about 5 minutes drive. The thing was: I noticed no one drove off the cars, so I thought it would be rather awkward to drive off, as if I was running away, an act of “kiasi” (afraid to die). I didn’t want to be made a talking point as “the only resident who drove his car away to prevent his car from being damaged”. So I brought my family to the main road, hailed a cab, and sent them off while I waited at the scene for updates. Once wifey settled Mayenne, she came back on the same cab, and by then the police was already releasing the residents back to their homes, one floor at a time. When our turn came, we had to waddle up the staircase – the lifts were not operational – amidst the puddles of water and retardant foam used to put out the fire. Then we reached the floor where it all started. Once we got back to our house, we washed ourselves up. It’s amazing how much black soot our nostrils accumulated over the short exposure to the smoke during our escape. And how much these soot would have gone into our lungs. So, a warning to all: NEVER UNDERESTIMATE THE SMOKE FROM DOMESTIC FIRE. The composition is not the same as incense smoke or BBQ smoke. Just one breath and you can feel the choke. We finally got into bed and lighted out at 3.30am, but we never did have a good rested sleep. Our senses were still open to any sensitive sounds or smell, in case of after effects. This morning, I left office at 8am. The lift was still not working, so I had to take the stairs. I walked past level 5, and decided to take a look at the unit that was burnt. Other than the black soot, the door and gate and the false ceiling still looked intact. It appears that it’s just a smoke built up. The fire probably wasn’t big enough to cause major damage to the common areas. 1. Equip with a fire extinguisher at home – in case the fire occurs right outside your unit. 2. Prepare a list of items that you want to bring with you, so that you can grab them without thinking. 3. Store some emergency items in the car so that you can have alternate source to turn to. 4. Switch off all electrical appliances, and close all room doors, so that it will slow down the spread of fire. If fire does not come from inside your house, close all windows – so that smoke or water from outside will not damage your property. I also hope that an alternate notification is provided to residents instead of just fire alarm. This is because of the frequent occurrences of false alarms that most people would disregard the bells. Such notification should be non-automated, e.g. getting a loud hailer to announce the emergency. Anything that make it sound like it’s done by a human and not an automated system that could be mistaken as a test message. This incident actually brought the community closer, because with only 1 of the 4 lifts working, we got to meet more people at the lift lobby and in the lift and there is a common topic to talk about.